Suffocates Scaly Leg Parasites Instantly. Intense fast acting formulation action against Scaly Leg Mite on Birds & Poultry including Chickens, Turkeys, Game & Cage Birds. Intense Action & Barrier Against Scaly Leg Mite : An intense treatment for an existing Scaly Mite problem. By direct application to the legs, feet, comb and wattle Scaly Leg Ointment suffocates scaly leg parasites instantly by physical means whilst soothing and calming irritation. 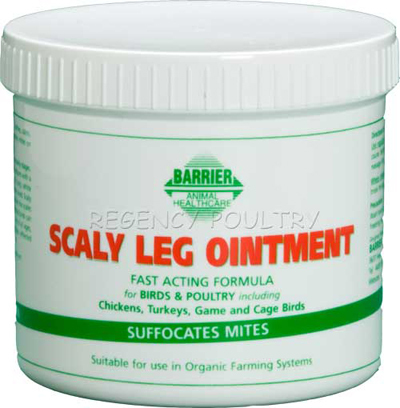 Scaly Leg Ointment can also be used regularly as a barrier against Scaly Leg Mite. All birds can be affected: Scaly Leg Mite affects birds of all ages, although older birds and feathered leg breeds tend to be more susceptible. Affected birds should be isolated and all housing cleared and thoroughly cleaned. Prevention is always the best option: Check for the tell tail signs of crusty, white deposits on enlarged, rough and lumpy legs where the scales have become raised. Living entirely on the bird Scaly Leg Mite cause pain and intense irritation for the bird as they burrow under the scales and into the skin of the legs and sometimes the comb and wattles. In severe cases of infestation the birds find it difficult to walk, may lose a toe and become severely deformed. Identification: Caused by Cnemidocoptes mutans and evident as tiny white spherical creatures with a diameter of less than 0.5mm Scaly Leg Mite is difficult to spot in the early stages. For this reason we recommend you use Scaly Leg Ointment as a barrier as well as to treat an existing problem. Directions for use : When buying in birds always check them over and treat them as a matter of course before introducing them to clean birds. Use Scaly Leg Ointment regularly as a barrier against Scaly Leg Mite. Apply liberally to the legs from the hocks down, not forgetting the comb and wattle which can also be affected. Affected birds must be isolated. Where infestation exists apply Scaly Leg Ointment liberally to suffocate the mites and soothe and calm irritation. Repeat application every 5–6 days to break the egg cycle. All housing must be cleared of bedding and debris and thoroughly cleaned. Use Barrier Red Mite X Concentrate, an effective control for red mite and other insect pests in poultry housing. Will Scaly Leg Ointment Taint Eggs: Scaly Leg Ointment will not taint eggs. Organic Farming Systems: Suitable for use in Organic and Intensive Farming Systems. This product falls into the exempt category of products which use only plant oils as active ingredients, as listed in Annexe IIB (Pesticides) of Council Regulation (EEC) No 2092/91 (as amended) and is therefore suitable to use in organic systems. There are currently no questions for Bird Barrier Scaly Leg Ointment - be the first to ask one!